Photo from The Tennessean.com, which I hope will forgive the use of this photo. 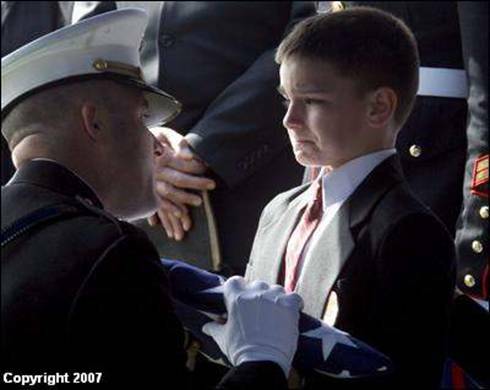 The story of 8 year-old Christian Golcynski accepting the flag from his father's casket is at�The Tennessean, here. In my view the attention and praise showered upon the youngster -- not to mention the vapid "stuffed animals" empathy train mindlessly switched his way -- are all wrong and will haunt him in a bad way throughout life. I'm reminded of the tragic Audie Murphy's Hollywood lionization after he returned from battle adorned with medals for his heroic exploits. Just let them be, I say. This maudlin praise is all about the person offering the praise, with no thought to the spritual suffering now and throughout the rest of life of the object of their praise. Feeling good about yourself is easy when you haven't paid the price. Cannot disagree with those thoughts, Sissy. Especially "This maudlin praise is all about the person offering the praise," but the photo is another matter. Totally agreed. The photo broke my heart quite in two. I have to disagree just a bit. For one thing, the praise is not maudlin. We who do not lose sons, daughters or fathers and mothers in this war have a need to share in the sadness of others. I use the word 'share' as in hoping to alleviate some of the suffering. I cry when I see old soldiers cry. I will never turn my head or avert my glance because I owe them part of my heart. There will come a day when this little boy feels fully the loss of his father, and he will look around and know that many many strangers cared enough to share part of their heart with him. I believe he will feel less lonely and bereft because of this out pouring of love, and as he matures, he will understand that the gifts were as much for his father as they are for him. How proud that will make him one day. I cannot cheapen the strangers' desires to extend their small offerings by calling them maudlin. What I am finding so hard this year is this: For all of my life I have bought a red poppy from a "veteran".Why I was a little girl many of them were missing a limb, or part of their face, or an eye, etc. Then slowly, I would say by the mid 1950's you did not see the wounded vets out there on this day. Oh yes, we still bought little red flowers from veterans, but in retrospect I understand now that those who were selling from the mid 1950's until this past year, they were the more fortunate ones--no missing body parts. This year however, it is different: this year I have to recognize that for the past few years, it has been harder and harder to find a vet selling red poppies. I had to drive to several different shopping areas to find one. There was one particular old guy--he was very polite, stooped over with age. I would look for him every year. I cannot find him this year, I could not find him last year, but I did not want to think about it. Yesterday, yesterday, I was forced to think about it: the old vet selling red poppies was not from WWII, he was from our war--Viet Nam. Not only did his age sterve as a reminder to me of of my own age, of war in general, this man reminded me of something else--this soldier was African/American, and I remember. I remember them all. Thank God I was able to find my little red poppy this year, for a time I feared that this tradition would be lost with the last soldier from WWII. We are lucky to have the most polite disagree-ers on the internet! Perfect agreement would be a bore. There's just no way to empathize fully with the Gold Star families. we the untouched are doomed to feel a little fraudulent to even try. The best we can do is still just all gesture. But gesture is something. Thank you for your service and ultimate sacrifice, Marine Staff Sgt. Marcus "Marc" Golczynski. A dear Uncle who served in WWII and Korea as a Marine celebrated his 100th birthday this week, and the Marines gave him a wonderful surprise visit. The old man is smaller in stature these days, but still ramrod upright. He was one of the lucky Marines to have survived. The Marines landed in NYC this week. A family member passing by got caught up in a sea of dress whites, and many asked to have their pictures taken with her. For some reason they insisted she speak at the big rally yesterday, which she did which much gratitude. Later she said how immensely moved she felt looking out upon these men who sacrifice to do men�s work*, America�s work, and the work of something far bigger and better than that of an explicit political- military mission. Made her wonder about the men who weren't there because they were injured or killed doing the hard, terrifying, gritty work of men and pragmatic angels. God bless our military. How can we not doubt that countless Iraqis and Afghanis call upon Allah to bless them, too? Thank you buddy--that is exactly right! "How can we not doubt that countless Iraqis and Afghanis call upon Allah to bless them, too?" Upon re-reading and in full acknowledgement that I would rather design structural systems or invent whimsy than write, did I knot say the opposite of what I meant to say? Oh, the wages of sin-tax. That's okay, Army --the thought shone--shined?--through. LOL --if it ain't a word, it orta be! Isn�t there a song �Shoned little glow-worm, glimmered, glimmered�? A family tradition which my grandmother started is our baking pies for house-bound vets we know and visit this day. It's not near enough, but it's something.